Photographs taken on modern cameras and smartphones often contain supplementary information such as the location where the photo was taken, camera or smartphone model, aperture settings and more. This is called EXIF and stands for Exchangeable Image File format. In compliance with GDPR, and also as good data protection practice, it is often necessary to strip this EXIF data from images we use and share on websites or social media. Even passing a client’s image to a print company means that you are sharing location data and maybe other details that wouldn’t be desirable. OK, so this is not always going to happen, but it’s an example of how you need to protect data that gets stored in the background without you knowing. How do I strip the EXIF data from my photos? Make sure that you have no boxes ticked (checked) and that the quality is set to 100 on the slider at the top. If you have anything ticked here, just untick it and select “Save” (* Note that I mean the Save button in this grey window that I have pictured, not any other one!). Close everything and on the next ‘Save As’ you’ll now see the new settings permanently applied. 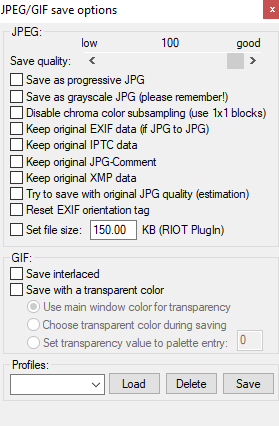 Don’t forget, the area that stores the location and other phone/camera details is called EXIF so you are stripping this off the image when you save it. You can also check the EXIF data by opening the image in IrfanView and clicking on the blue ‘i’ button on the toolbar at the top. There you will see another button marked “Exif info” which will give you all the data attached to that image. If you don’t see this button then it has been removed already. You are now hopefully more aware of the need to be vigilant about important data connected to images stored both online and on your computer system and/or network. For completeness, you should be aware that EXIF is also available for audio files so these need to be treated the same way for data protection using different software tools.